Next year’s reboot The Amazing Spider-Man will come out just five years after Spider-Man 3, which means Sam Raimi’s trademark swooping, speedy web-swinging action will be relatively fresh in comic-book-movie fans’ minds. 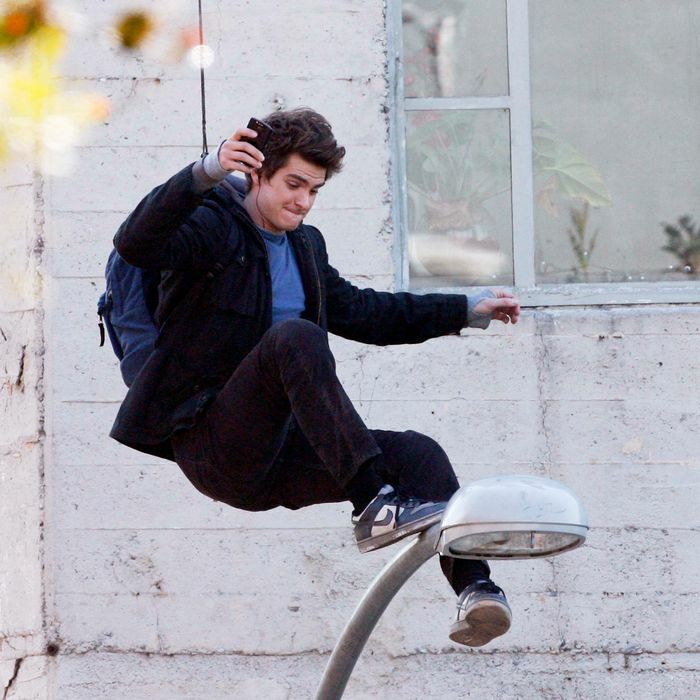 Can director Marc Webb and star Andrew Garfield possibly compete with that? Well, Vulture has just uncovered a series of paparazzi photos that hint everything’s going to be okay. A shutterbug (not unlike Peter Parker!) sneaked some shots of a slam-bang sequence being filmed in L.A. that appears to show a pre-Spidey-suit Parker experimenting with his new powers. We have no access to the script, but we have provided descriptions of what we think is happening throughout this tense and kinetic scene. Warning: You’re gonna want to sit down, because even without moving pictures, things get crazy.